Hardin County Honda is proud to announce that we’re working with Active Heroes, an organization that supports U.S. military service members, veterans, and their families. 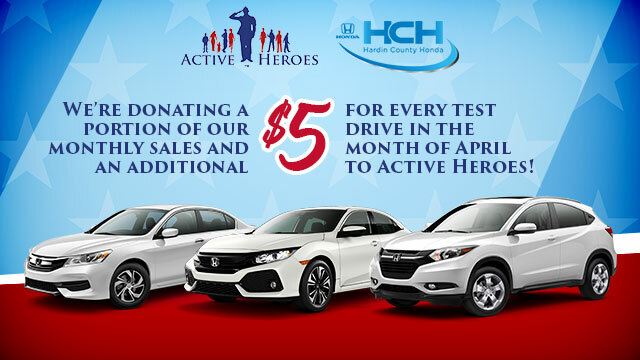 Throughout the month of April, we are donating a portion of our monthly sales and an additional $5 for every test drive to support Active Heroes and all that they do to help our community. Active Heroes is headquartered in Louisville, KY, but it provides programs and support for military members, families, and veterans across the nation. The organization was founded in 2011 with a focus on ending the prevalence of veteran suicide. It has since grown to include a retreat center, a community center, and a peer mentor program. Active Heroes has a number of national signature activities to allow individuals and communities to participate in their goals. Golf tournaments, push-up challenges, motorcycle runs, 5ks, and video game tournaments are just a few of the events they host regularly. There are a lot of ways to help support Active Heroes. First, you could donate money or your time to be a part of the programs and activities they offer. You could also take a look at their online store and buy a shirt or accessory to provide financial support and spread awareness of the issues they’re fighting. And of course, throughout the month of April consider stopping by Hardin County Honda for a test drive or your new ride to help us support this great cause.